21st March 1556 was the day on which Thomas Cranmer, former Archbishop of Canterbury, was burned at the stake at Oxford as one of the victims of the reign of “Bloody Mary”. If anyone can be credited with being the architect of the Church of England, then the honour has to go to Thomas Cranmer. He was the loyal servant of King Henry VIII who stepped in where Thomas Wolsey failed, namely in getting Henry’s divorce from Catherine of Aragon. He was also instrumental in obtaining Henry’s second divorce, namely from Anne of Cleves. Cranmer was definitely the “king’s man” who fully supported the notion of the king holding absolute power, including over the Church. 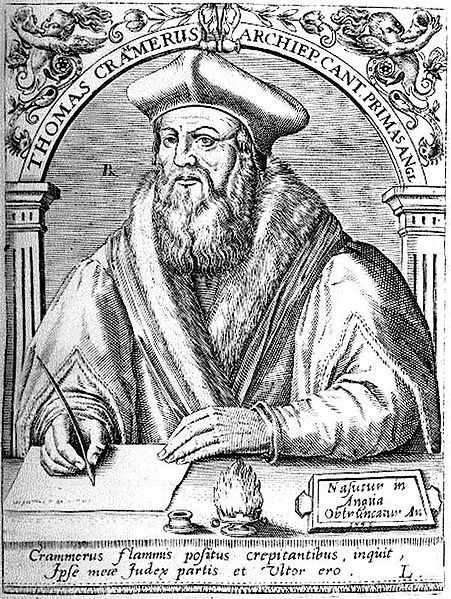 After Henry VIII died in 1547, Thomas Cranmer continued to lead the Church under the monarchy of King Edward VI. During this reign of six years he drew up the doctrines and structures of the new Church. His abiding legacy is the Book of Common Prayer that is not only a theological document but one of the masterpieces of English literature. However, when the boy king died in 1553 Cranmer made the mistake of siding with the stated intention of Edward that his cousin Jane Grey should succeed him on the throne in preference to his Catholic sister Mary. The plot unravelled very quickly, leading to the deaths of most of the major figures and the ascent to the throne of Queen Mary. Cranmer was tried for both treason and heresy. The treason charge would have been enough to send him to the block, but the punishment for heresy was the more terrible fate of being burned alive. Cranmer signed a document in which he recanted his heresy, presumably out of cowardice. However, he later recovered his courage and declared that he did not recant his heretical (i.e. anti-Rome) views after all. He therefore suffered the fate of being publicly burned at the stake. As the flames rose higher he pushed his right hand into the nearest flame, declaring that this part of his body, which had done the most unworthy thing by signing the recantation, should suffer first.